Your bedding and linens may be fluffy and cozy, but there may be some not-so-nice things hiding in them that require an eco-friendly clean. Last year, we learned that many of you don’t regularly change your bed sheets in our American Laundry Habits Survey. 17% of men and 7% of women say they never wash their guest sheets. When it came to washing bedding, around 7% of men said they only wash their sheets every six months and 10% of men said they couldn’t remember the last time they did it. Your beds and linens are full of (bad) surprises that could be affecting your skin, allergies, and sleeping habits. We can help restore your bedding to a fresh, clean state. Why is getting your bedding and linens cleaned by a professional so important? There are five main reasons why you should refresh your bedroom in 2019. 1. 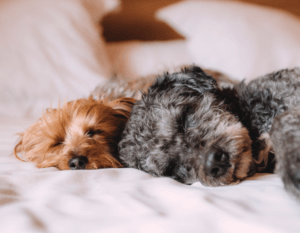 Dust Mites: Dust mites are microscopic bugs that feed off of dust, dirt, and dead skin cells left behind in your bedding and linens. It’s estimated that 1/3 of your bedding and linens could be infested with these pesky little bugs! They can cause allergy flair ups! The right combination of eco-friendly detergents and care can ensure dust mites don’t take over your bedroom. 2. Animal and Human Hair: Hair isn’t always easy to spot. It can get deep inside your linens and bedding. Sometimes, even high-powered washers and vacuums can’t remove all the hair! A professional cleaner is able to remove all the hidden hairs you may not notice with your eyes. 3. Dead Skin: Believe it or not, your skin falls off in your sleep, even if it’s not flaky! On average, a person will shed about 1.5 pounds of dead skin a year. Dust mites love to feed on dead skin, so making sure your bedding and linens are washed regularly can help keep the dust mites away. 4. Bugs: Besides dust mites, other microscopic bugs can linger in your sheets. From bed bugs to fleas, your home can create an atmosphere for these little triggers to set up shop. 5. Sweat: Did you know the average human sweats 2 gallons of sweat a year? Now imagine most of that sweat being soaked up by your pillows, blankets, and sheets. When was the last time you had your bedding and linens professionally cleaned? With our eco-friendly detergent and processes, not only will you refresh your bedding and linens but we’ll send them back to you toxin-free. Refresh your bedroom and wake up feeling refreshed this fall!